Upgrade to a Tripleblaze Topo Subscription for access to 15,000 topo maps. 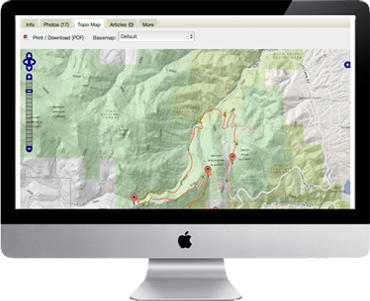 Zoom into a topo map for the ultimate details - terrain, trails, roads, landmarks. Choose from ultiple topo background options like USGS scanned, Open Cycle, satellite topo, and USGS topo. Plus get recommended routes and elevation profiles for select trails like the AT, PCT, and CDT. Print a PDF map with elevation profile. 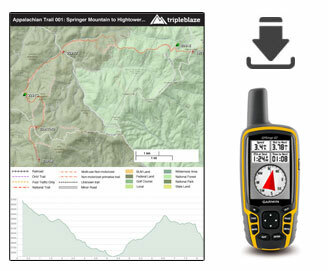 Or download GPX or KML-formatted GPS data onto your GPS device to take with you on the trail. View a sample map here. Navigate the trail on your smartphone with the Singletracks iPhone or Android app. Topo maps are even accessible offline.